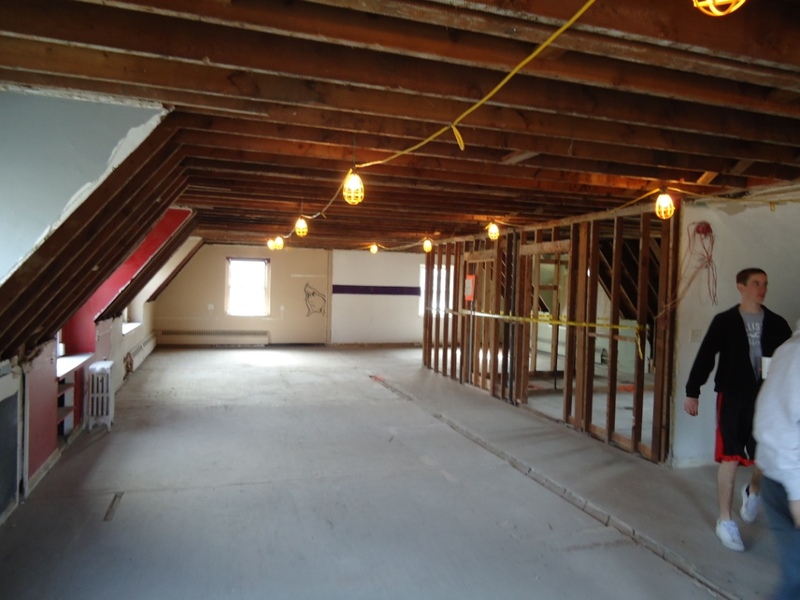 The rooms start to take shape. Taken from the southeast corner of 4South. 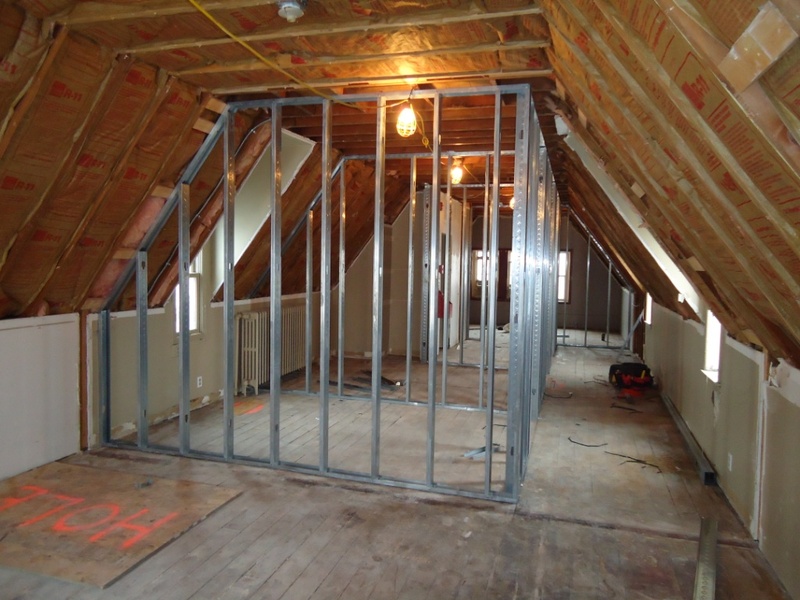 The rooms on the old side start to take shape as walls are being framed – 4th floor walls are up and 3rd floor is underway. 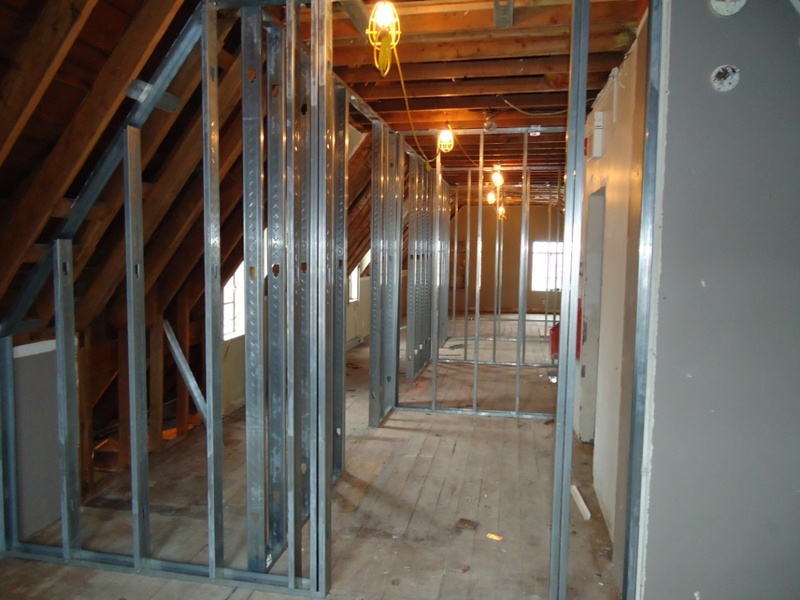 Metal studs are being used on the old side – a great fire safety improvement. 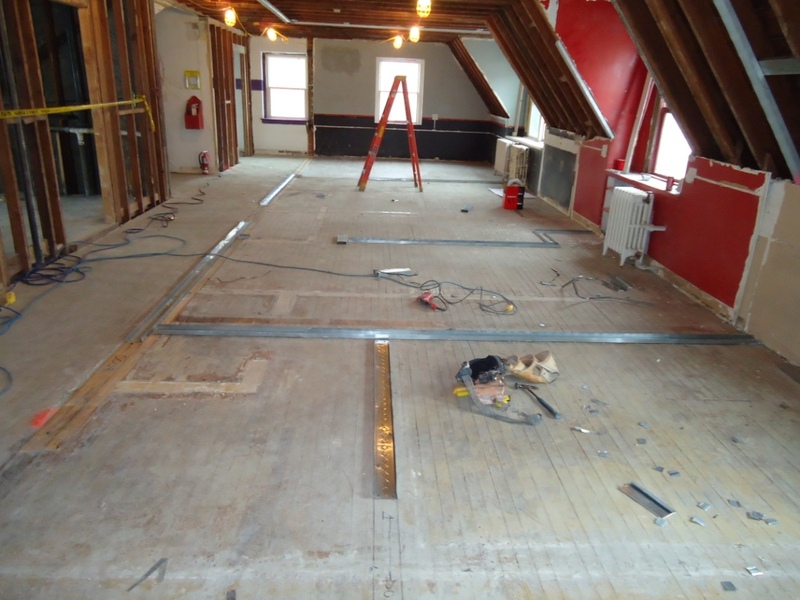 The new floor plan will be two or three smaller sleeping rooms off a central study room. 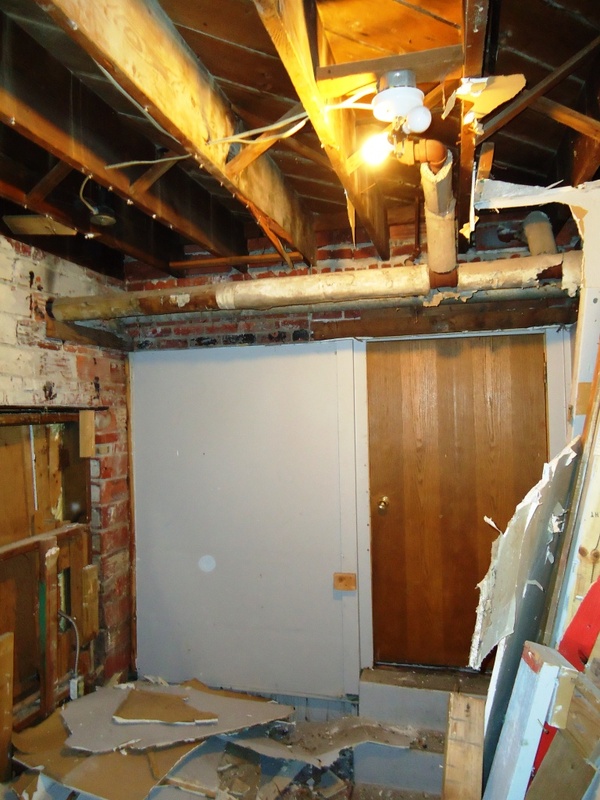 The boiler room saw some action with the removal of asbestos. 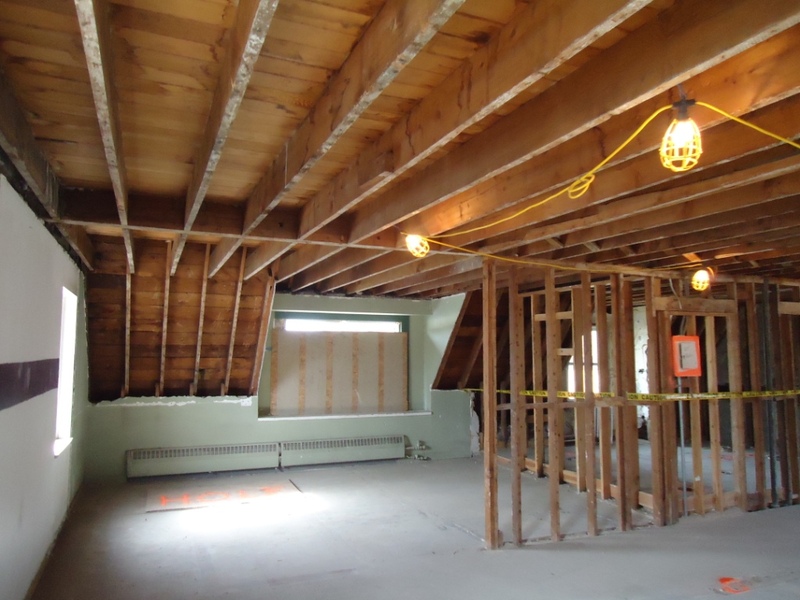 Thankfully, asbestos was only used on the joints and fittings of the 1964 heating system. The existing heating system is a combination of steam (for the old side) and hot water (for the new side). 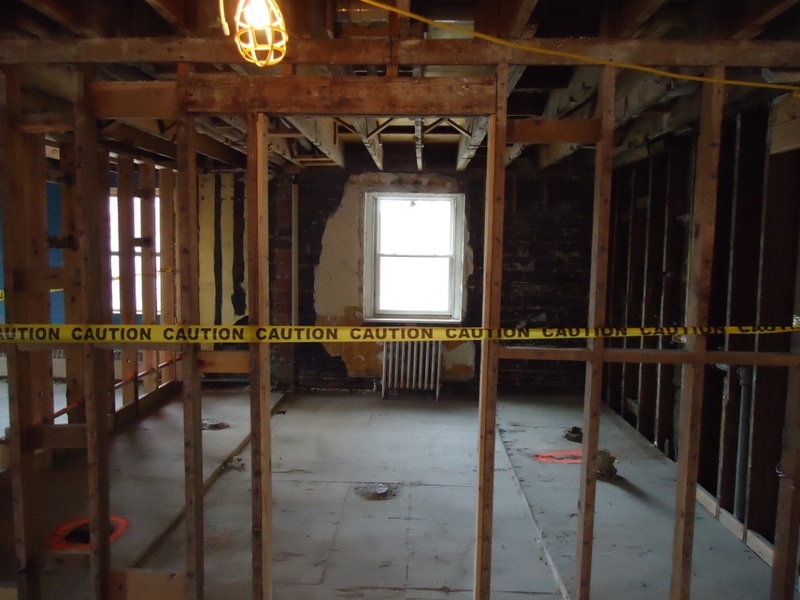 It will be converted to all hot water – which will allow for air condition to be installed throughout the entire house. It will be a more efficient heating solution since we will no longer have to heat the water to the boiling point and will hopefully save on repairs (ask me about the $2,500 butterfly valve we had to replace a few years ago). A little mechanical work happened early this fall when the bottom of the 1964 300-gallon hot water storage tank failed. The house manager reported that a loud ‘hissing’ sound was coming from the boiler room and when they opened the door it was spraying water everywhere. 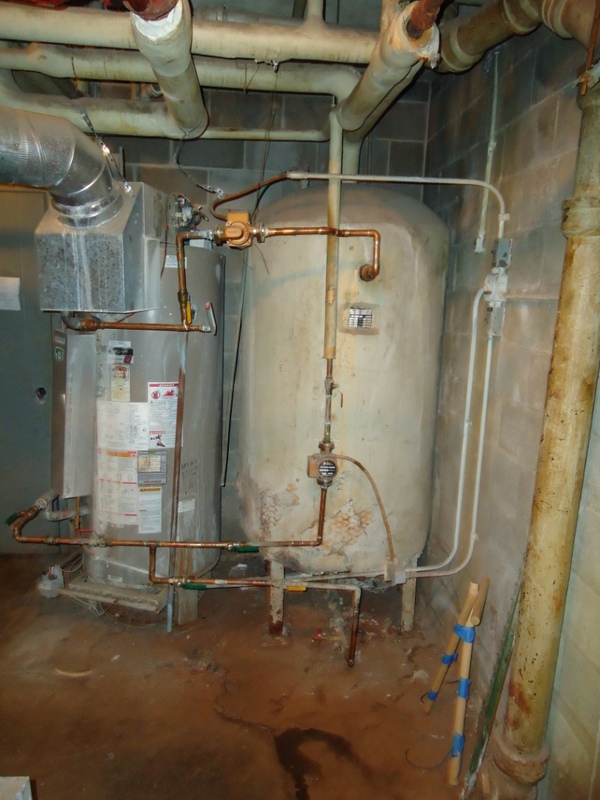 At the same time, our 1997 hot water heater went on the fritz (not surprising – it was nearing the end of its life). 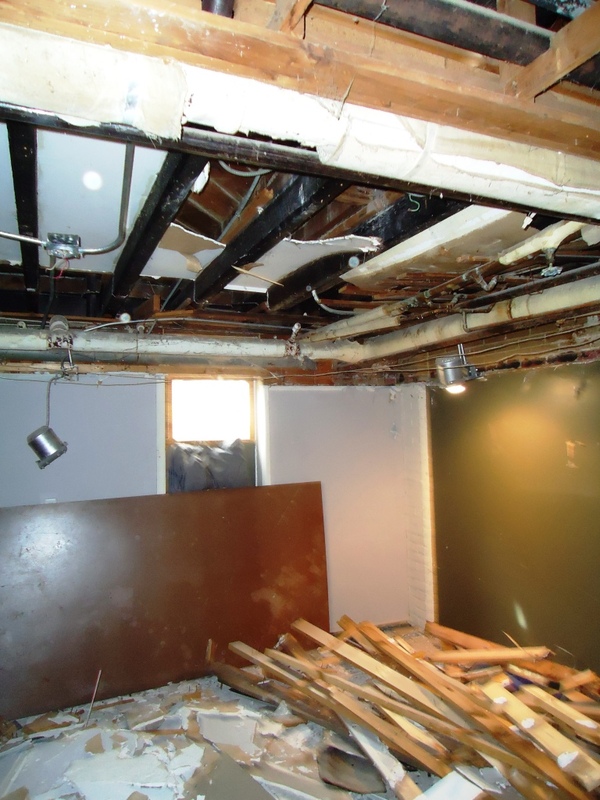 Thankfully, we were able to work with Tom Colvin, 1970, President of Colvin Engineering Associates in Salt Lake City to find a fantastic solution. 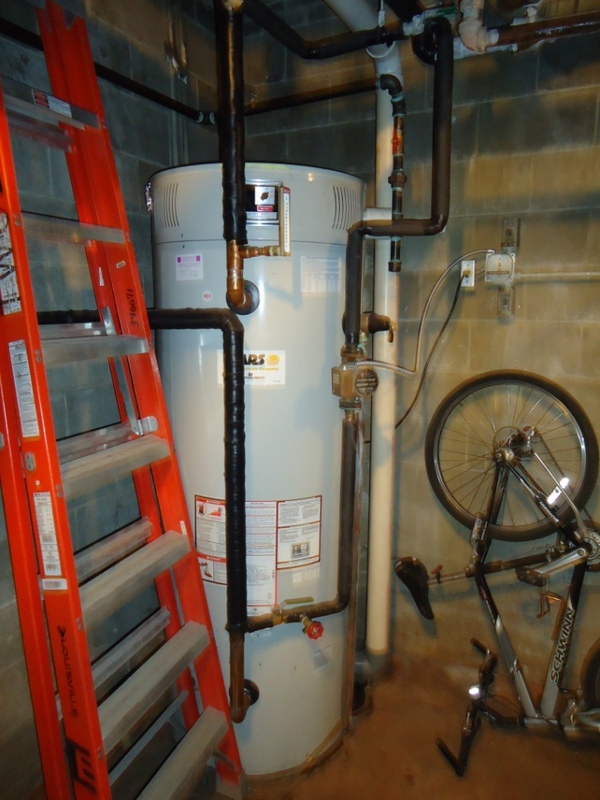 We now have a 100 gallon, 399,999 BTU hot water heater that can produce 514 gallons of hot water an hour – plus, it is 93% efficient! Thank you Brother Colvin! Oh, and 91 windows were ordered this week. Standing in 4north, looking to 4south. 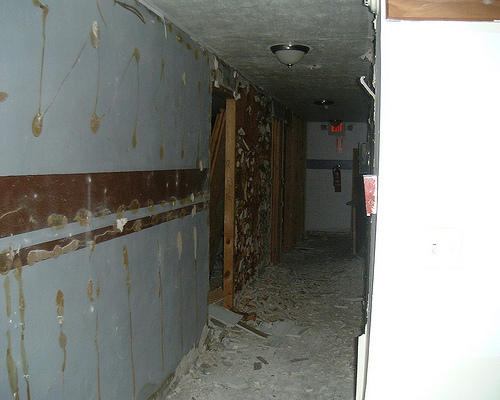 3rd floor — standing by the south wall (room 302) looking to the north (room 300 – grey wall, 301 – red wall). The new metal base plate shows the new layout. 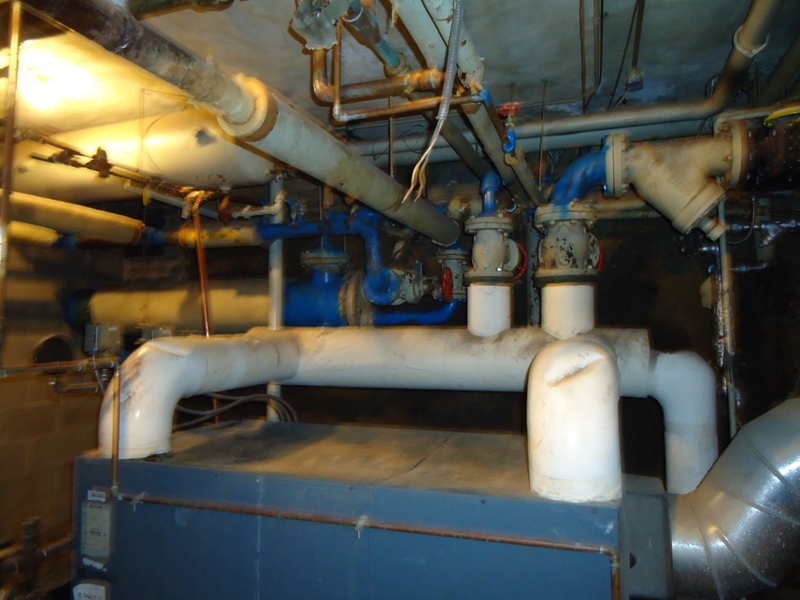 Taken in the boiler room — the blue pipes used to be covered in asbestos. John Binning, Class of 1945 and Mike Nickischer, Class of 2014 share the honor of turning the soil with the spade used for the 1964 addition. NOTE: This event already happened – but we just received the photos and wanted to share a few with you. 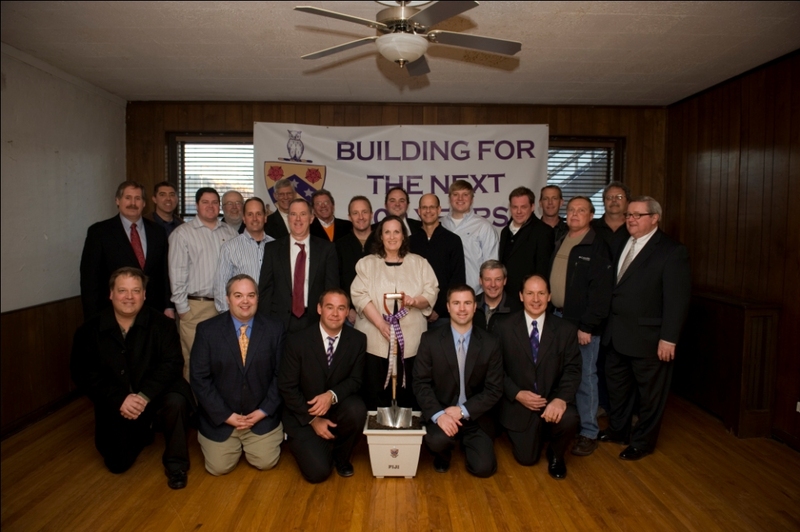 Lambda Nu Graduate and Undergraduate Brothers symbolically broke ground on Friday, February 4 officially starting the construction phase of the project. 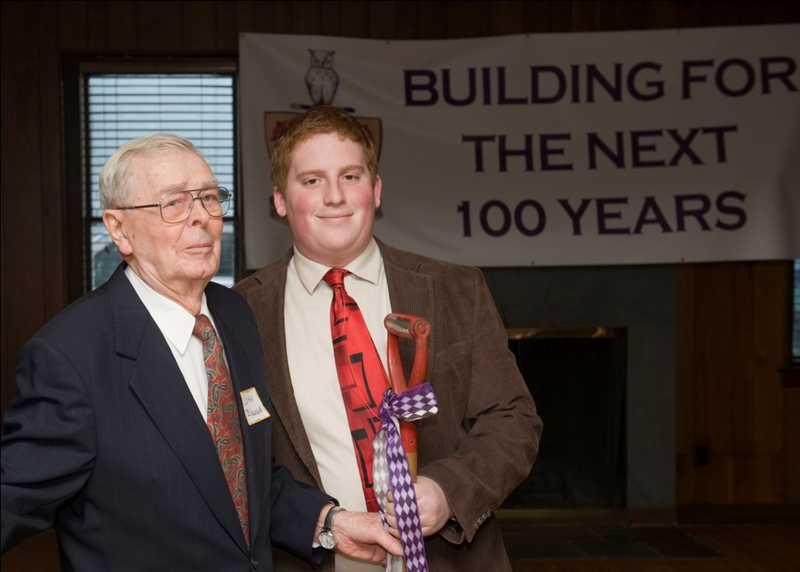 Purple Legionnaire Adam Goll (Nebraska 2007) emceed the event which featured special welcomes from John Osterholm (Nebraska 1995), Dr. Joe Skradski (Nebraska 1983), William Grubb (Nebraska 2013) and John Gottschalk (Nebraska 1965). 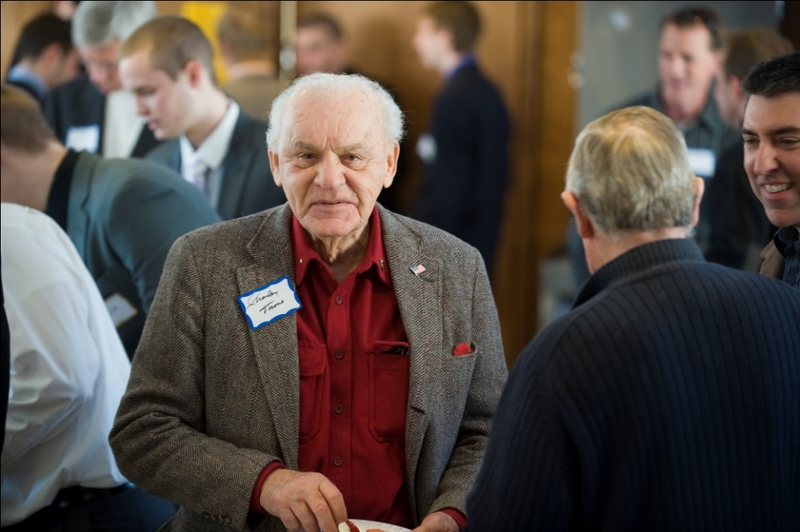 Additional honored guests included John Binning (Nebraska 1945), N. W. ‘Jerry’ Solomon (Nebraska 1951), Governor Charles Thone (Nebraska 1944) and Linda Schwarzkopf, Director of Greek Affairs and Dr. Matthew Hecker, Dean of Students. Brothers enjoyed a reception in the dining room then gathered in the living room for the ceremony. 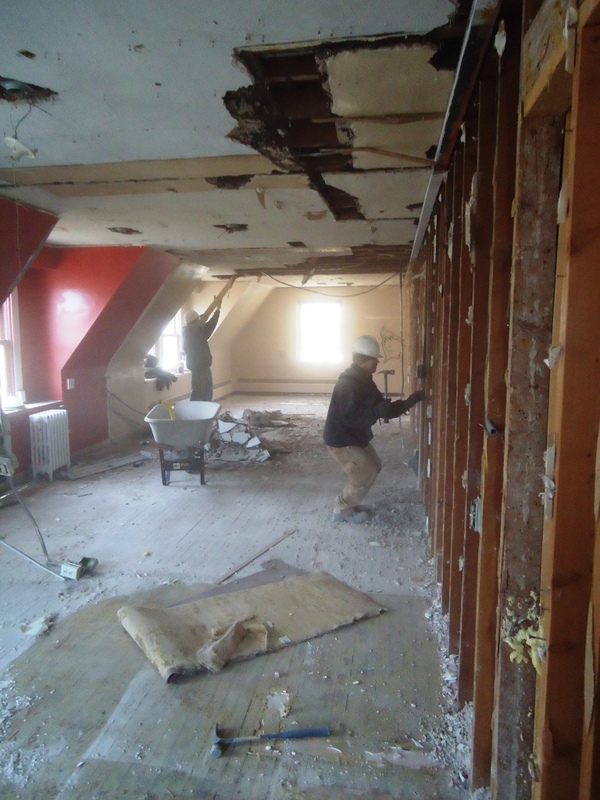 Be sure to check out the pre-renovation and event photos by click on “More Photos” on the right. 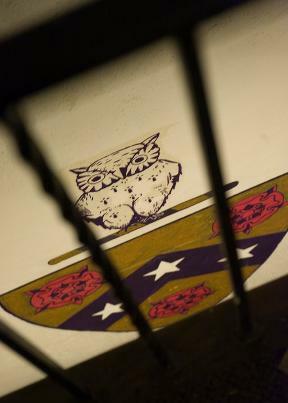 The House Corporation gives a special FIJI thank you to Sarah Pfeiffer of Pfeiffer Photography for taking photos. Reception in the dining room. 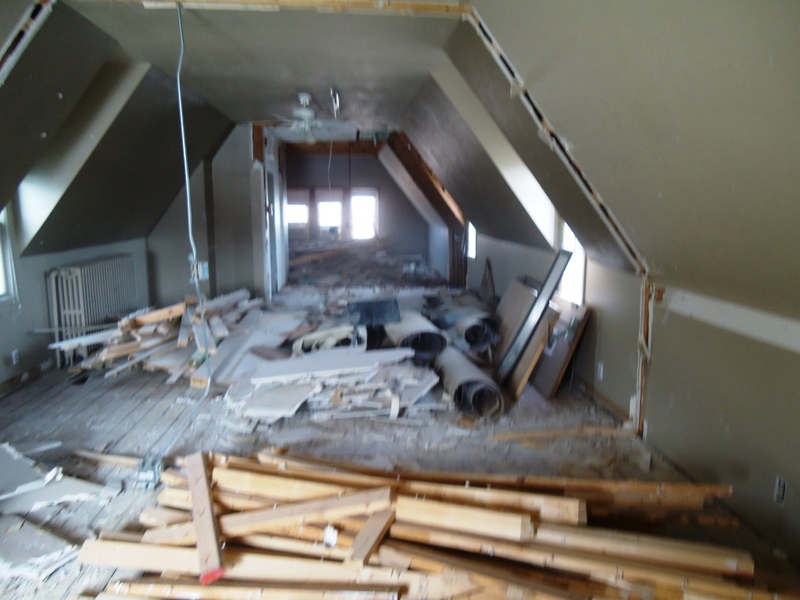 In a matter of three days – a significant amount of the old side is all but a memory. The crews have removed the majority of 2nd old and 3rd old. 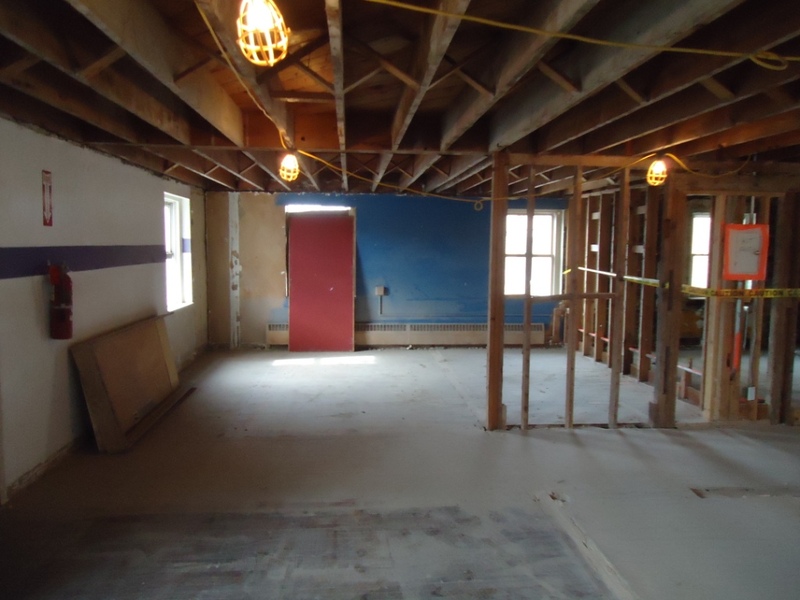 The 4th floor is one large room and B1 and B2 are now stripped bare. The girl’s restroom went out of service today as a door was put into the south wall for the housemother to access her bedroom. The housemother’s living room door is no longer able to be accessed as demo starts in the living room soon and the doors will be padlocked. Today’s excitement was fire alarm havoc – apparently construction dust and the old smoke detectors do not play well with each other. 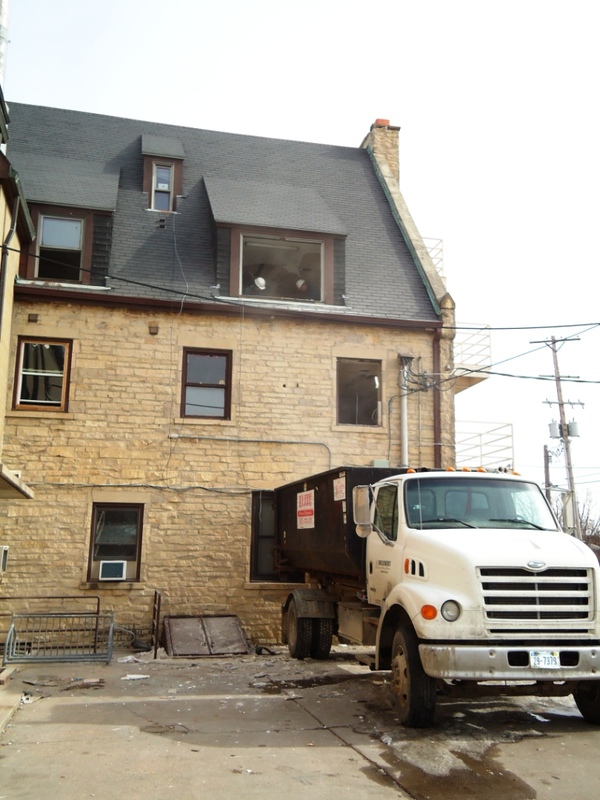 Thankfully the fire trucks were only out once for a false alarm before the construction crew and our alarm monitoring company caught on to the issue. The nice part is that all the fire alarm equipment is scheduled to be updated to ensure the chapter house continues to be a safe environment for our undergraduate brothers. 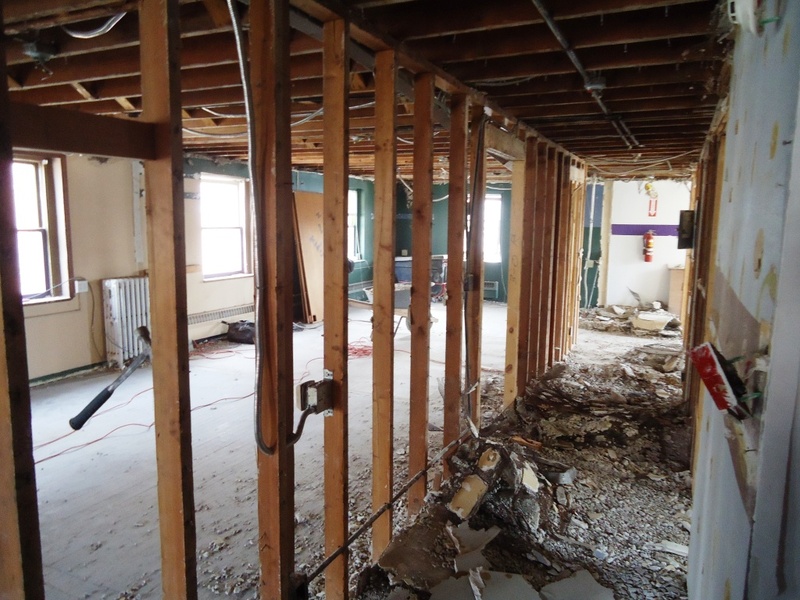 Take from the 2nd floor door — looking towards what was 201 (tan wall) and 202 (green wall). 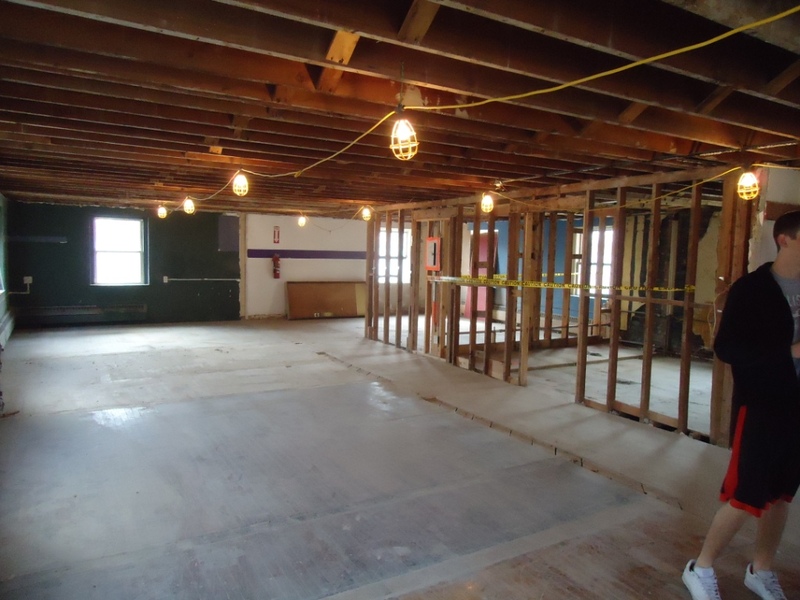 2nd floor — taken from the southeast corner (what was room 202). the green wall was in 200. 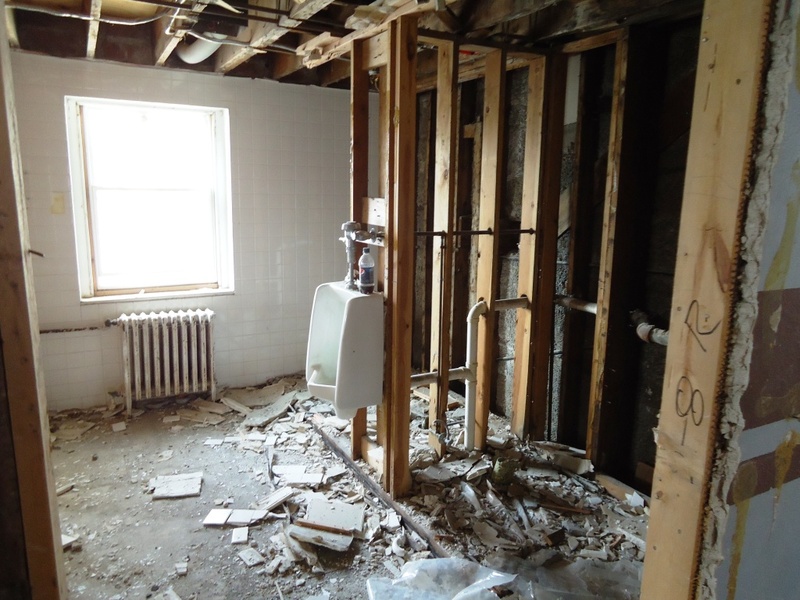 The most important bathroom fixture is left in 2nd old. 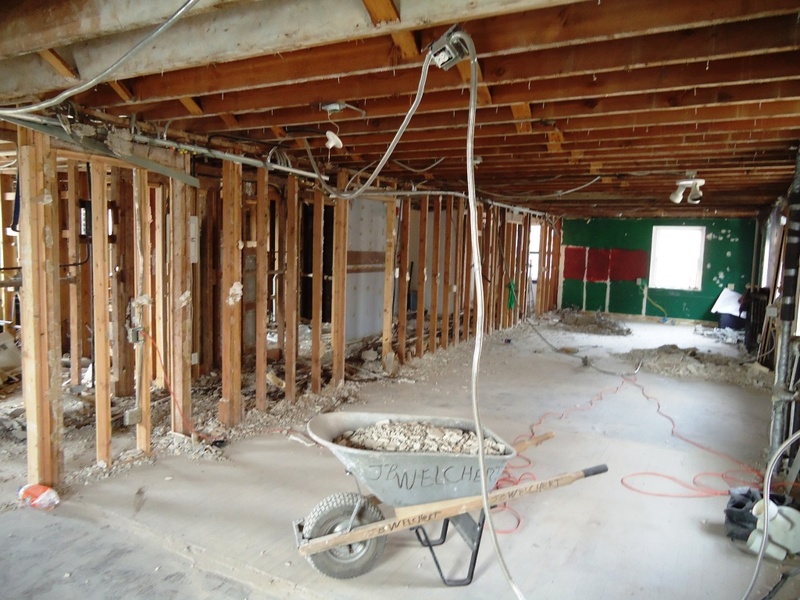 Looking from the door into the area where the stools used to be seated. 2nd old bathroom — looking into the shower area. 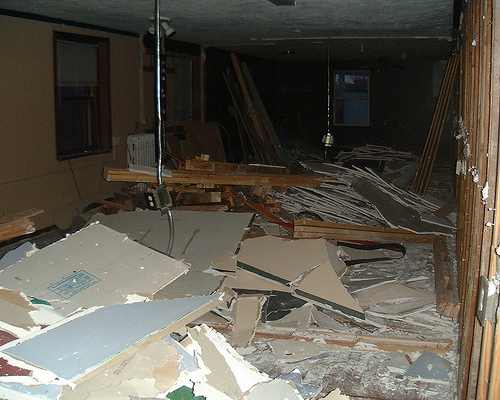 The pile with the sink is in room 203. 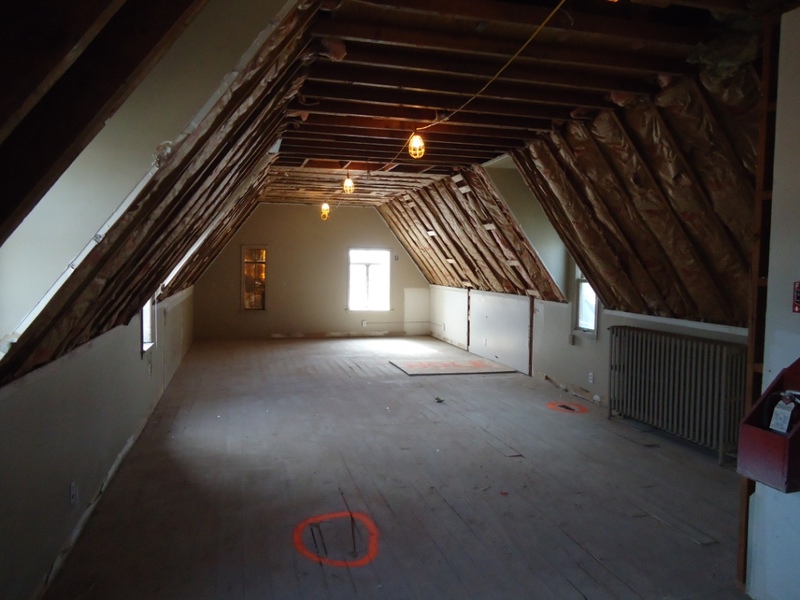 Moving to 3rd floor — photo taken from room 300 looking south into room 301 (red wall) and 302 (tan wall). Standing in room 301 looking into room 300 The hallway walls and celiling were made up of plaster over expanded wire mesh. 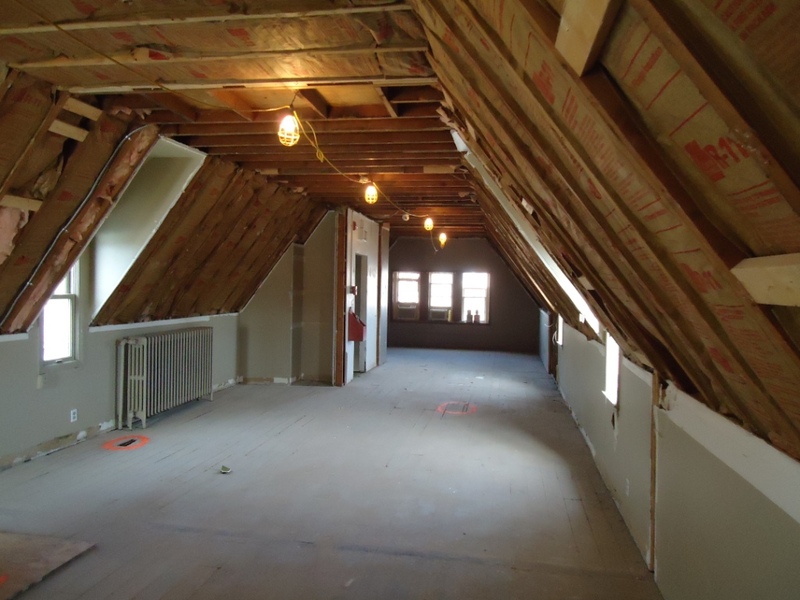 4th floor — from the landing looking south into 4South. Standing along the south wall in 4South — looking into 4north. 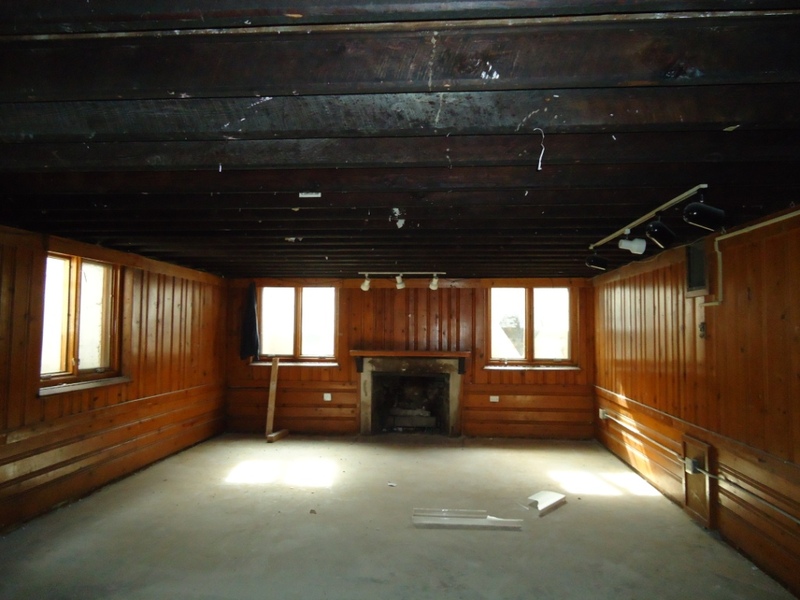 The basement room/diamond room. 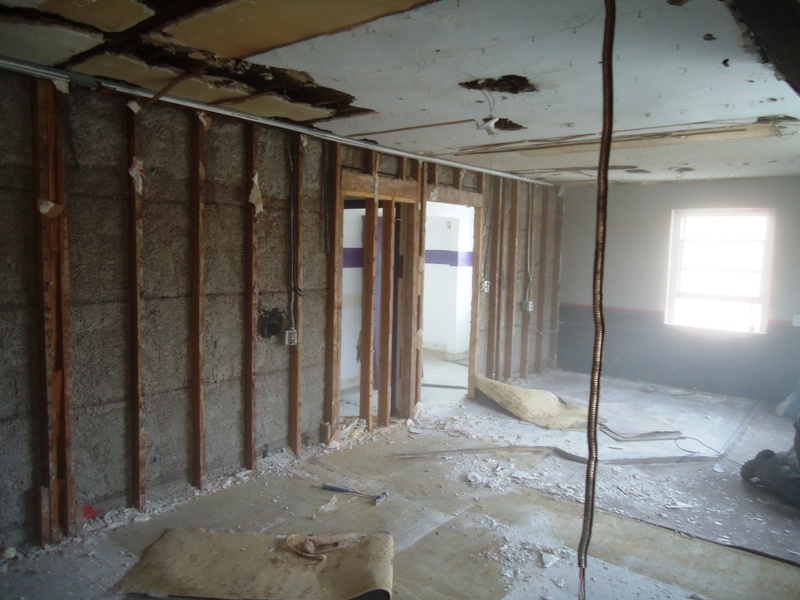 The carpet has been taken up and ceiling has come down. 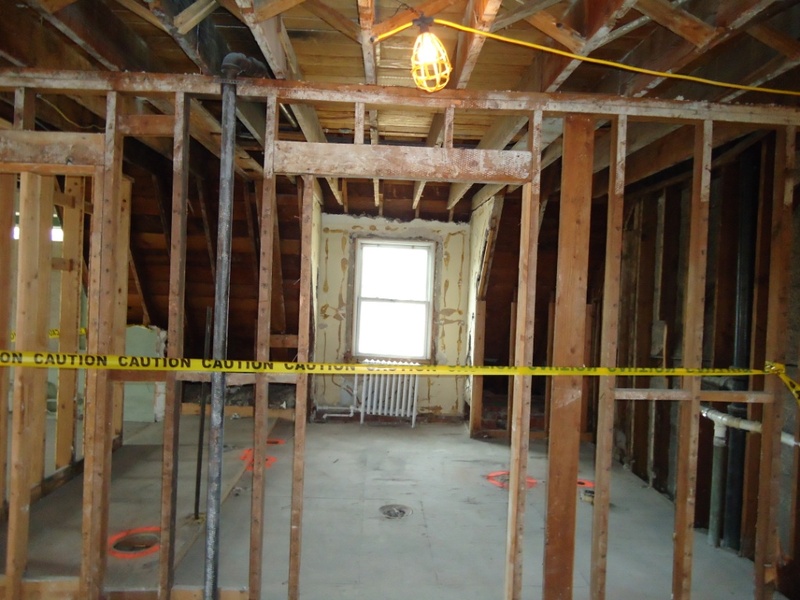 B1 living room — the ceiling is down exposing all the heating pipes and plumbing. 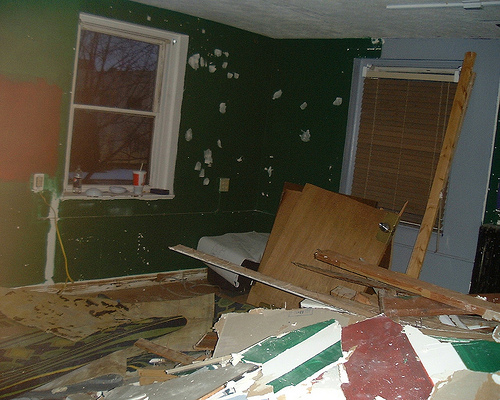 This room as been problematic for years – when a pipe would go bad upstairs, it would ultimately drain into this room – ruining quite a bit of property over the years. 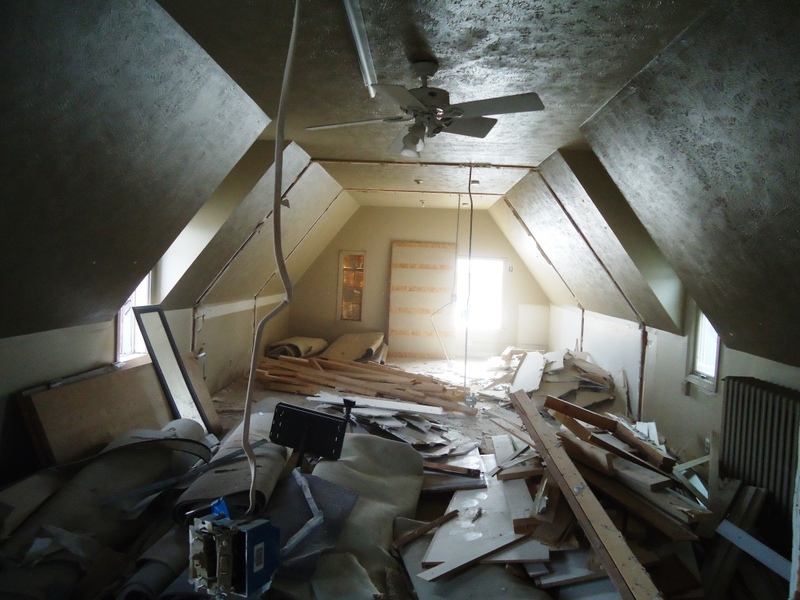 This will no longer be a bedroom after the project is complete. The bedroom in B1. 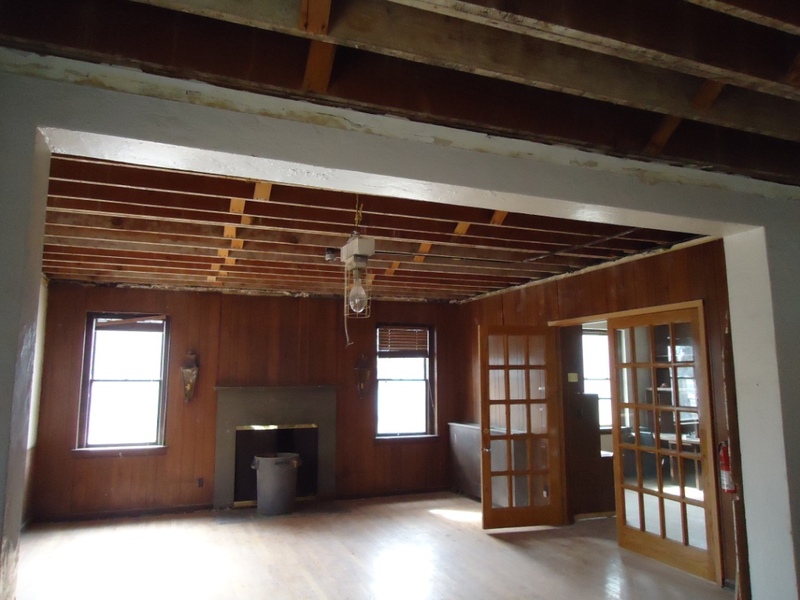 The ceiling has been removed. 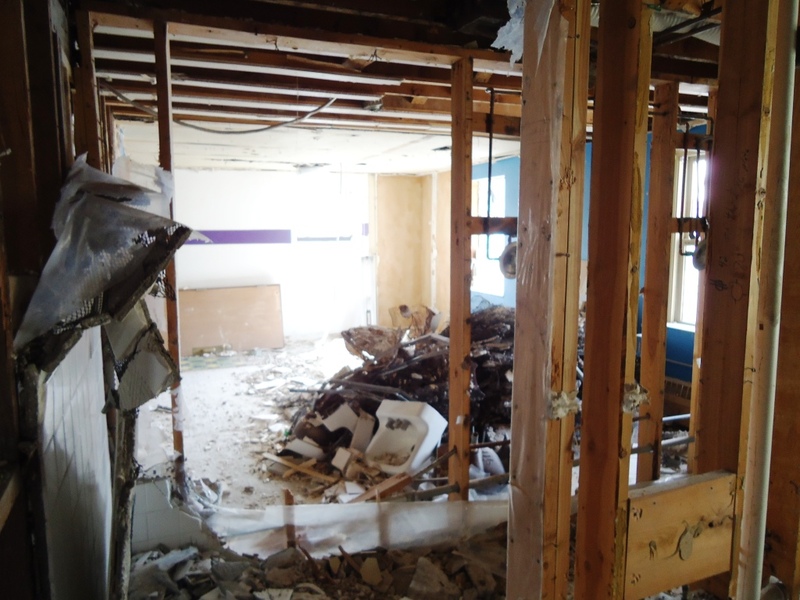 The keys to the old side were handed over to the demolition crew at 8.15 this morning and by this afternoon rooms 200, 201 and 202 are now history. 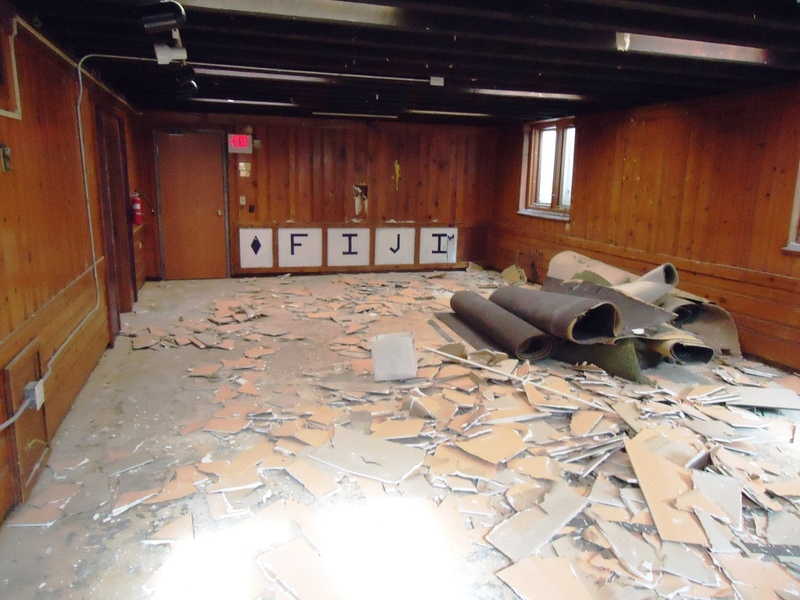 Tomorrow they will start hauling off the old FIJI house to make way for the new floor layout.